Book royalties are proceeds paid to authors based on a percentage agreed to in the publishing contract. Many large publishers pay a low percentage of 5–10% based on the list price of the book. So, if the book listed for $17.95 for the softcover, the author would receive $.89–$1.79 in royalties per book. Koehler Books pays author royalties based on the net proceeds of the book, meaning the money left over after all expenses have been paid to the distributor and the book has been sold to a wholesale bookseller, library or other distributor. The net is then split with the author according to the percentage agreed to in the contract. iii. On the sale of the Work via foreign rights translation, the Publisher will pay the Author fifty percent (50%) of the Net Receipts. Co-publishing model (60% royalties): We are the publisher of record. We handle the creative development and technical work, as well as marketing, coaching the author, and managing the royalties. Co-publishing deals typically pay higher royalties because the author is investing in the development of the book by paying creative development and other pre-publication fees. Co-publishing is also referred to as hybrid publishing. Traditional publishing model (40% royalties): Has the lowest royalty rate because the publisher is handling all expenses and wants to earn back their loss. Same publishing structure as co-publishing. We are the publisher of record. We handle the creative development and technical work, as well as marketing, coaching the author, and managing the royalties. Ebook royalties are usually the same rate as print books. When Do You Get Your Royalties? Most publishers start paying royalties well after the publication date. This allows time for the publisher to get paid by the distributor, which can take several months. It also allows for returns, which typically are higher in the first year after publication. Koehler Books typically starts providing royalty reports and any accompanying royalty checks six months after the publication date. Royalty reports are given on a quarterly basis, meaning at the end of March, June, September, and December. If that six-month period falls in the middle of the quarter, the author must wait for their report/check until the end of that quarter. What Sales Period Are We Paying Royalties On? 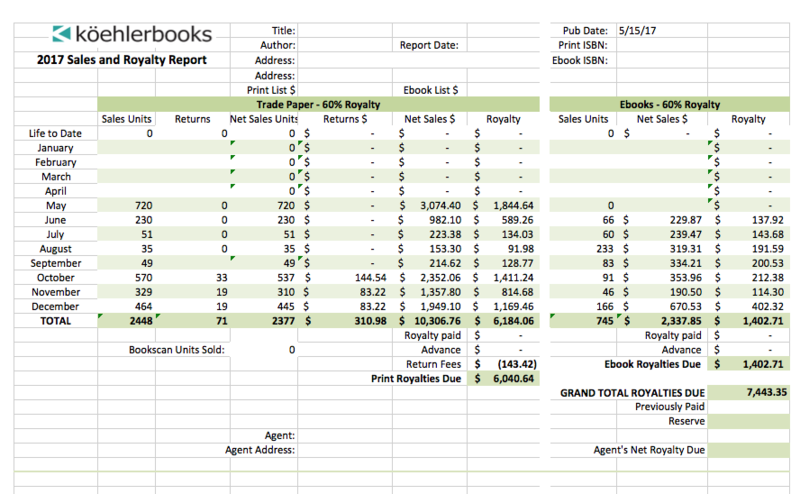 Koehler Books pays on sales that occur six months prior to the end of the reporting quarter. Which means that any sales that occur within the past six months will NOT be paid out, but will roll over to the next quarter. Eventually this means that our authors are getting paid on sales made during a 3-month period. The Publisher shall make quarterly royalty payments and statements to the Author beginning six months after date of publication, so long as there are Proceeds available for payment to the Author. If the amount due for any accounting period shall be less than $100.00, the balance shall be applied to the next calendar quarter until the royalty payment due equals or exceeds $100.00. The Publisher may deduct any overpayment to the Author from any royalties due and owing the Author on the Work. This is an actual report of a successful debut author. Print sales on the left, Ebooks on the right. Both numbers combine on bottom right. Sales Units are in the first left column, less returns in second column, with net sales the third column. The next two columns multiply the units by the net figure left over after wholesale price less printing is established. In this case, the net is about $4.38. The royalty column then multiplies that by the royalty percent of 60%. Return fees are subtracted, and you have your print royalties due.